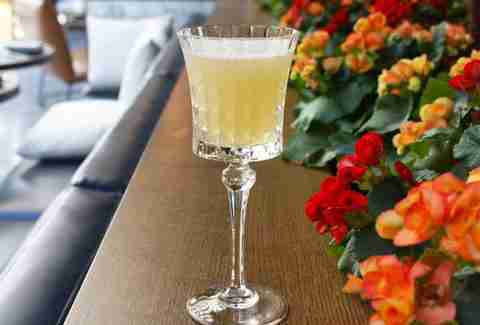 The best cocktails in town may seem difficult to prepare, but they don’t have to be. Sure, you may enjoy an ice cube the size of your face in your drink from time to time, but what if you could craft well-balanced cocktails with a few ingredients at home? We challenged Chicago’s top mixologists to develop inventive cocktails using only three components (aside from garnishes). 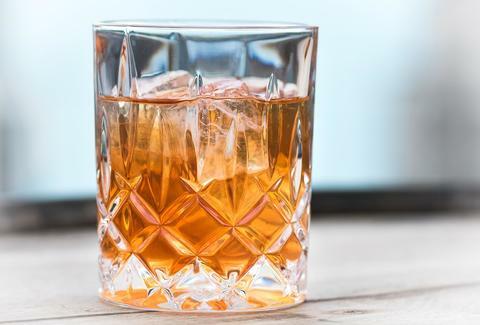 The resulting drinks include a variety of spirits from bourbon and gin, to rum and mezcal, allowing you to get creative whether you’re relaxing at home, or looking to impress guests. Build ingredients over cracked ice and stir. Finish by expressing the oils from a grapefruit peel over the top of the drink. In an empty mixing glass, build the cocktail adding the bitters, Sorel and Rittenhouse. Add fresh ice and stir. Usually 30 rotations will chill and dilute the cocktail to the optimal level. 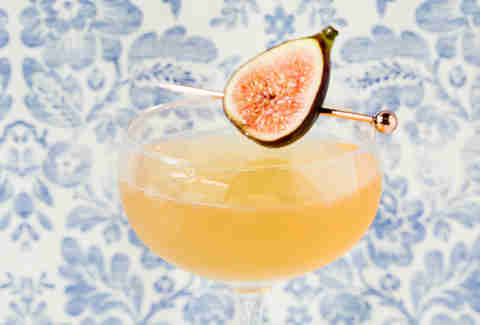 Strain the cocktail into a coupe and garnish with an orange ribbon. Shake well, strain, and serve up. Measure and pour each ingredient into a shaker tin, fill the other tin with ice. Shake for 10-12 seconds then strain into Collins glass with ice. 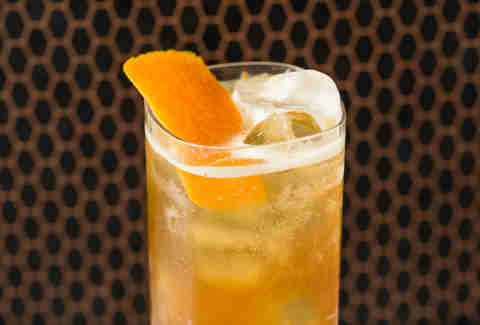 Top with soda water, peel orange swath, express and garnish. 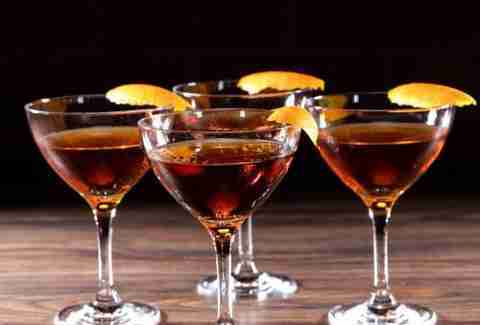 Strain into coupe or martini glass. Garnish with expressed orange peel (ideally flamed). Combine all ingredients into a shaker tin and add ice. Shake well. Fine strain into a chilled coupe. Enjoy. Repeat. Enjoy. Repeat. Enjoy. Strawberry cordial: In a sauce pot combine 2 cups water, 2 cups white sugar, and 1.5 cups diced strawberries. Bring to a boil and let simmer for 5 minutes. Blend everything and fine strain. Chill for later use. Combine rum, mate syrup, and lime. Shake over ice, strain, serve up. Combine loose tea with hot water to brew a strong tea. Let steep for 10 min. Be careful to not over steep, as the tea will become tannic and very bitter. Strain tea through fine mesh tea strainer, being careful to not press to hard or pass loose tea through the strainer. Combine tea water, lemon peel, and granulated sugar in a sauce pan on medium heat, until sugar is dissolved. Pour your choice of either bourbon or mezcal into a pint glass. Juice 1 entire quartered Granny Smith apple (seeds and all) with a Breville or Robot Coupe-style juicer into the pint glass. Mix in a mound of ice and enjoy! Double strain into martini/cocktail coupe. Combine all ingredients in a mixing glass and stir over cracked ice. Strain into chilled coupe and enjoy. Do This 10-Stop Drinking Games Crawl. Become a Chicago Bar-Sports Legend. 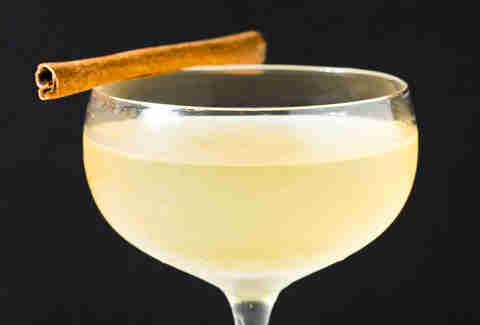 Shake until chilled, pour into the coup glass, and garnish with a cinnamon stick. Amanda Topper is a contributing writer for Thrillist Chicago, foodservice industry analyst, and food blogger for TheGhostGuest.com. Champagne is her cocktail of choice. Follow her at @AmandaTopper.